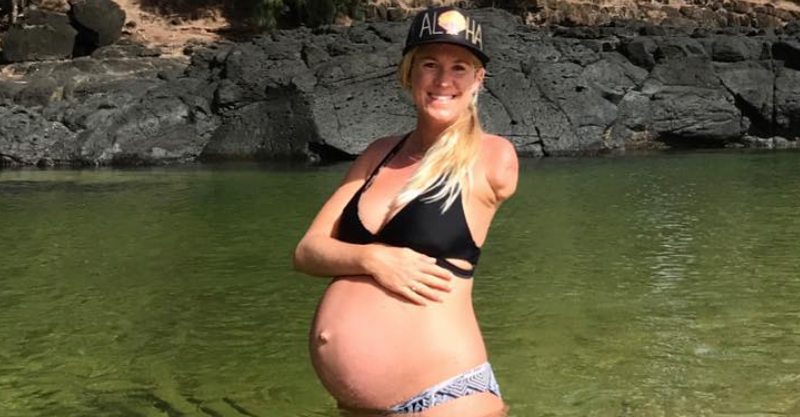 Bethany Hamilton, the amazing mum who skateboarded and surfed right through her third trimester, has welcomed her second child with husband Adam Dirks. This unstoppable and inspiring woman took to Instagram to announce the birth of a brand new baby boy named Wesley. The photo Bethany shared is the embodiment of newborn exhaustion and excitement, although teeny Wesley looks a wee bit unsure about life out in the world. Bethany married Adam, who is a minister, back in 2013 and their first child, Tobias, was born in June of 2015. They announced a second baby was on the way in October and have been keeping followers updated on Bethany’s pregnancy via Instagram since then. Bethany first flashed onto our TV screens and front pages in 2003 when, as a 13-year-old champion surfer, a tiger shark attacked her as she floated on her surfboard with family friends. She spent just three weeks in hospital after losing her arm and returned to the water quick smart, learning to surf again and going on to win multiple championship titles. In fact, she won TEN competitions after mastering surfing with one arm. Bethany says her faith has played a huge part in helping her recover and refocus on her pre-shark attack dreams. She’s now making it her mission to inspire others’ strength, hope and bravery. This now mum-of-two has been hatching another amazing project, too. A documentary about her life is due for release later this year.